Currently, Jerome Powell and the Federal Reserve are hearing criticism stating they have over-tightened monetary policy jeopardizing this expansion. On December 18, 2018, just prior to the last hike, President Donald Trump tweeted a warning to the Fed suggesting they should not hike rate. The data justified another hike and Powell moved forward. Did they make a policy mistake by hiking rates in December? Only time will tell. Jon Snow can relate to this scrutiny. The northerners questioned his decision to sail south responding to the request from Daenerys Targaryn. Jon may have made the correct decision as his alliance with Daenerys grows stronger by the day. Jerome Powell and the Fed may be on the right path as well. Observe the chart showing the Fed is not too far off from the equilibrium rate that would control prices and allow the economy to endure. Even though Powell may be on the correct path, it did not stop Trump from criticizing him at every turn. The Fed should act independently and shouldn’t concern itself with noise from politicians. That said, it is difficult to take a prudent stance when Trump denounces his intention to fire you. The game of chicken where Powell attempts to act independently and Trump threatening to remove Powell appears to have ended with Powell blinking first. In January, the Fed held rates in place and moved to an accommodative policy stating they do not foresee any additional hikes in 2019. This is reminiscent of 1967 when the Fed reversed course and later lost control of inflation in the 1970s and 1980s. This political rhetoric is a troublesome development that undermines the Fed. The foundation of the Fed is built on independence. The success of the Fed is predicated on their ability to focus on the data and block out the noise from the media or politicians. When people start doubting the Fed’s ability to control inflation, Fed policy loses it's effectiveness and integrity, and may presage an economic disaster. Similar to when Jon Snow’s own people tried killing him for his conceived betrayal. What does Cersei think of this new found alliance between Jon Snow and Daenerys Targaryen, and what does Trump think about Jerome Powell paying attention to objective data? Trump reacted hastily by attempting to insert his puppets, Herbert Cain and Stephen Moore, in to the Federal Reserve. To nominate these two for the Federal Reserve Board is comparable to Cersei destroying half of Kings Landing with wildfire. Both nominees are extremely partisan and lack the economic acumen to be taken seriously for this position. I’ll admit that both have more economic knowledge than your average Joe, but neither has a Ph.D. in economics like the other members of the Fed. I would say both of these candidates belong in the knowing enough to be dangerous category. Nominating either of these members would be like sending someone that just learned to fight up north to battle the White Walkers. Stephen Moore has promulgated that growth does not cause inflation, and that the Fed should focus on commodity prices rather than overall prices changes (i.e. inflation). Below, is a chart that plots the percentage change of a basket of global commodities against inflation measured by the Consumer Price Index which has an energy component to it, and Core Personal Consumption Expenditures which strips out food and fuel. The latter is the Fed’s preferred measure of inflation. Looking at this chart, and the volatility of commodities, would you want the Fed to set policy based on commodity prices? Can you see a meaningful relationship between inflation and commodity prices? To me, this would create a lot of noise and distract the Fed forcing them to adjust policy based on external forces to commodity prices. My assertions are corroborated when Stephen Moore does not even know how to react to his own policy proposal. Mr. Moore advocated for higher rates under the Obama administration when commodity prices fell 57% and argued for lower rates under the Trump administration when commodity prices rebounded, the output gap closed, and the economy reached full employment. Maybe the members of the Fed should be required to have Ph.Ds in economics. This requirement would prevent Stephen Moore and Herman Cain from annihilating the Fed faster than wildfire destroyed the Great Sept of Baelor. The real enemy isn’t Circe, it’s the Night King and the army of the dead who are marching south. For investors, the Night King symbolizes a recession and the end of this bull market. In Game of Thrones, many refuse to believe the fairy tales about the Night King even though evidence is pilling up that White Walkers exist. In the stock market, the yield of the 10-year Treasury Bond was less than the yield on the 3-month Treasury Bill. This is called an inverted yield curve. Inversions like this have occurred prior to every post WWII recession. Despite this ominous sign, the market continues to rally. Is the market choosing blissful ignorance over the reality that the Night King and army of the dead are coming for them? Interest rates have been held at near zero for a prolonged period of time. This has forced savers to move into riskier assets than they would otherwise be comfortable owning. The hunt for yield and returns has created a market that appears manic. One can observe this euphoric behavior in the IPO market. Currently, about 80% of the technology companies going public are not profitable, roughly the same as the Tech Bubble. Yet, these companies have no trouble attracting investors. Remember Snapchat? In normal markets, public investors are reluctant to invest in companies until they have confidence the company will be profitable. This vigilance keeps markets from overheating. The frivolous behavior of investors allocating capital to these unprofitable companies is a cautionary development. This euphoric behavior paired with the hunt for yield has also propelled the rise of an army of dead stocks. Companies that are insolvent and should be bankrupt but investors continue to provide them with capital keeping them alive. Pundits call these companies “Zombie Stocks.” Below, you can see the ratio of Zombie Stocks has been climbing this expansion. These companies do not generate enough cash flow to service their interest costs. 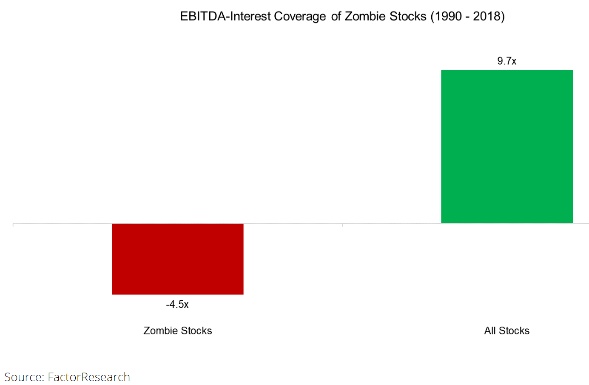 To the right is a chart showing the the Interest Coverage ratios of Zombie Stocks and normal stocks. However, investors are rewarding these companies with higher valuations than their profitable counterparts. Euphoric behavior like this provides additional evidence we are close to a recession. The Price-to- Book ratio measures the price investors pay for one dollar of equity in the company. Is there any hope? Will the army of the dead devour us all or can Daenerys Targaryn and her dragons prevail? For investors, Daenerys represents the stock market fundamentals and hope that all is not lost. She has dragons, and the army of the dead burn. What more do I need to say? Year-to-date, all sectors in the S&P 500 have positive returns. In addition, interest rates are still relatively low, the Fed is dovish, household balance sheets are healthy, the labor market is robust, and GDP is growing at a steady clip. After the Fed reversed course in January, the stock market is tied for the fasted recovery from a bear market since WWII. Source: GSAM. As of April 5, 2019. These are all reasons to believe the recession is further away than most think. The yield curve just inverted, but this may not prognosticate an impending recession. Yield curve inversions are an omen of a recession when the inversion persists longer than a quarter. The recent inversion, when the 3-month Treasury Bill had a greater yield than the 10-year Treasury, was brief lasting only a few days. Furthermore, the shape of the curve is not the reliable indicator it once was. Through quantitative easing, the Fed and central banks around the world have distorted the yield curve. Yields overseas are near zero, so foreign investors have been buying a large volume of U.S. bonds. This pushes the longer end of the yield curve lower. Now, short-term yields have a lower bar to clear before the yield curve is inverted. That is not to say the yield curve is meaningless, but I would encourage you to confirm the signals from the yield curve using other indicators. The last reason we should not be overly concerned in the next year, credit spreads still look healthy. Sharp increases in credit spreads have presaged recessions in the past, and continue to be a reliable forecasting tool as the credit market tends to foresee deteriorating fundamentals before the equity markets. Yes, the Night King and the army of the dead are heading south, but they are walking, and it may take a while for them to arrive. From the chart to the right, you can see in three of the last four Does this mean the living will prevail? As I mentioned, the fundamentals are still healthy, but those fundamentals are not as strong as they were in 2017. Daenerys may have a large army and dragons, but she only has two dragons (not three) now that earnings growth is expected to be negative this quarter and the one-time boost from a tax cut was left behind in Meereen with the Second Sons. The Fed may be overly accomodative, and the optimistic reaction by the stock market may be short-lived. That does not mean the Night King will win this fight, it just means the battle will be more difficult than the stock market believes based on the current price movements and a near-term adjustment in the market would not be surprising. We are in the final season of this economic cycle, so there will be suspense and excitement throughout. 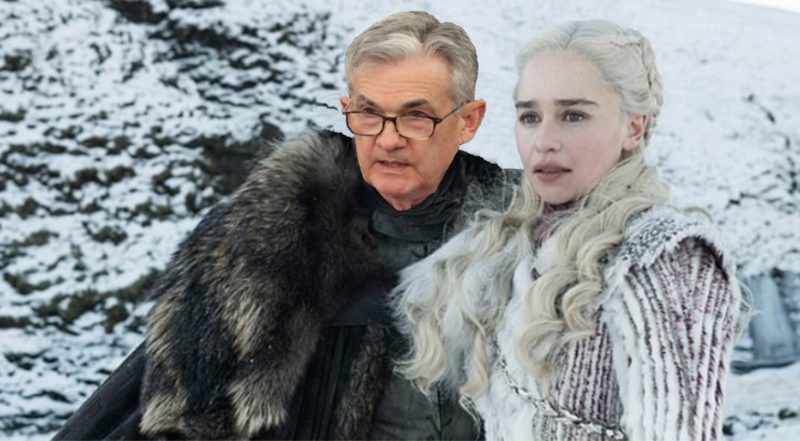 At the end of the day, our prediction is for the stock market to continue to reach new highs and Daenerys to hold off the Night King for at least another year.